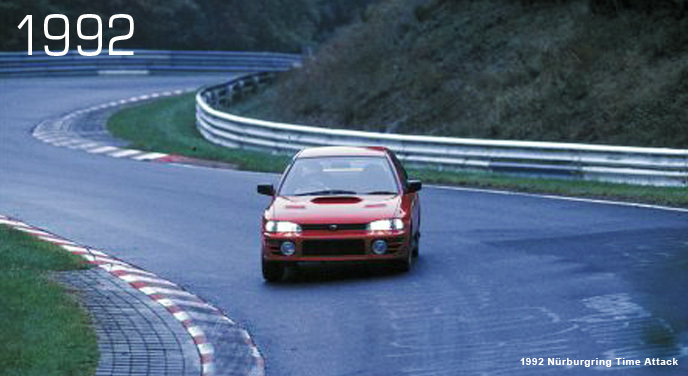 In October 1992, the new Impreza WRX conducted a time attack at the Nürburgring, recording a best lap time of 8:28 '93. This was an incredible result for a 2-litre car at that time. The driver was motor journalist Kazuo Shimizu. However, not satisfied with the result, and knowing there was a new model coming in four years, the Impreza went back to the Nürburgring with a view to improve the mechanics on the car. This time, racing driver Takayuki Kinoshita set a new record time in the Impreza WRX STI ver III, an 8:10'75. 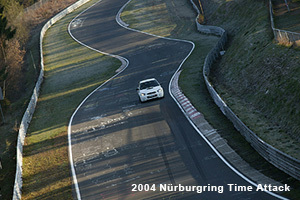 This time around, the 2nd generation Impreza WRX STI Spartan Model spec C was brought to the Nürburgring. With Kazuo Shimizu driving again, it breached the 8 minute barrier, recording a 7:59'41 to enter a new stage in SUBARU's NBR challenge. With its light-weight body, ball-bearing turbo, the spec C went on to dominate the Production Car World Rally Championship. Machine development at the Nürburgring became routine for the development team at SUBARU, and a special garage was set up near the track.